A tenant landlord relationship will have bumps along the road. 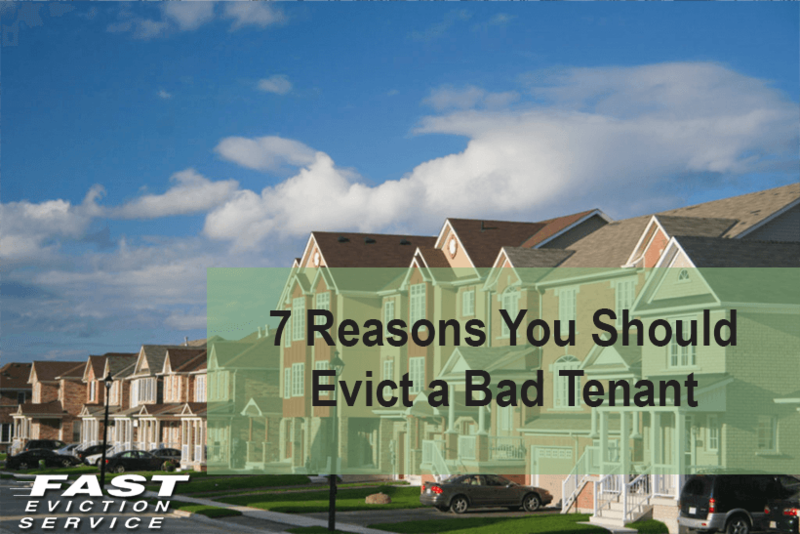 Your tenant may be causing too much trouble, but you do not know if it is the right reason to evict them. In addition, different states may have different tenant eviction laws, so make sure you abide by them. Know that California has some of the most extensive regulations regarding tenant’s rights in the country. It is advisable to be cautious and to go through the following general reasons, which can be reason enough to evict your tenant and save yourself the trouble later on. If your tenant has failed to pay the rent of one month, it is time to consider evicting them. It is highly unlikely that they will be able to pay you a lump sum rent amount later on, of 2 months or more. To save yourself the stress and worry of nonpayment of rent, you should take immediate action because eviction takes time, and if you haven’t received rent for a month from a bad tenant you may not receive more before you have evicted them. If your tenant has made it a habit to pay you late rent, without a definite reason, this is reason enough to evict them. You cannot rely on a bad tenant, and make yourself and your family suffer due to the loss of rental income. Bill payments, utility payments or other things may be dependent on the rent you get. You cannot risk losing your position or dipping into family savings each time to pay your bills. You can give the bad tenant a notice, but if they still continue to pay late rent then it is time to consider evicting them. If your bad tenant has caused a significant damage to the property, you may want to evict them. Remember, the damage must be more than a normal wear and tear. For example, chipped paint could be wear and tear but if you see a hole in your exterior wall, it is damage to your property, which will have to be fixed soon. Also, the damage must be caused by the tenant or due to their negligence. If the tenant agrees to get the damage repaired, you may consider not evicting them but if it were something significant or persistent, you would want to evict them in order to save your property. If your tenant is causing a disturbance to the neighbors and you are getting complaints about them, it is reason enough to evict them. You may give them a warning to quit such behavior, which could be playing loud music but if they continue with their disturbing behavior, you have a reason to evict them. The Right to Quiet Enjoyment – to be able to work and sleep in peace without disturbance – is what all of your tenants are paying rent for and cannot be taken by a bad tenant who doesn’t respect that. If your tenant were using your property illegally for illegal purposes such as drug smuggling, you would want to evict them straightway. You cannot risk your reputation and your property due to the illicit behavior of your tenant. This is grounds for eviction of a bad tenant. If the lease agreement has expired and still the tenant refuses to empty the space, you have a reason to evict them. Sometimes tenant do not want to move to a new place or may take a lot of time in shifting or finding a new place. In such an instance, you can send them a notice to move out within a certain number of days or else you will have them evicted. If the tenant has failed to abide by the lease agreement terms, you would want to file for eviction. You may want to issue them a notice to quit but if they still fail to abide by the terms, you can have them evicted. Such a breach of terms could be a violation of a pet policy or tenants living in the property more than were allowed in the terms.